Q. When I try to rotate one layer they all rotate. Why? A. Photoshop Elements does what you tell it to do, so sometimes you have to be more specific. 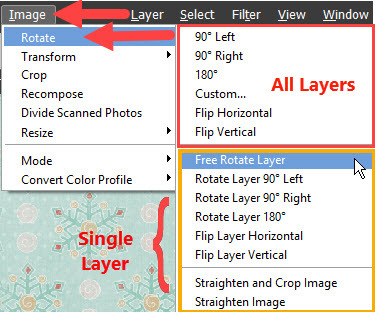 If you use the Rotate button at the bottom of the workspace, all the layers will rotate. From the Menu bar, you can be more specific about what you want to rotate. Go to Image> Rotate> Choose the appropriate option. The first six options above the line (in the red box) apply to all the layers. The next six options (in the yellow box) will apply only to the layer you’ve selected. Notice they all contain the word Layer.